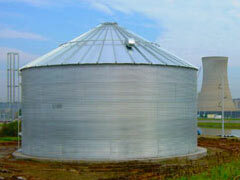 Mars corrugated steel tanks offer reliable fire protection for commercial, industrial, agricultural, and rural firefighting. Our fire suppression tanks can greatly improve emergency response efforts. 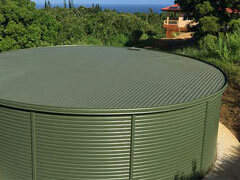 Corrugated steel tanks provide a solution for non-municipal hydrant areas or where adequate water supply is unavailable. When the demand for water exceeds the area water supply, firefighters can take advantage of this bulk water storage. 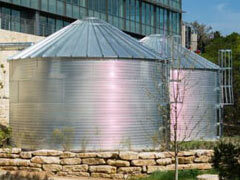 These corrugated water storage tanks can connect to a fire hydrant outlet that can resupply fire water during an emergency. Additionally, in order to meet local fire code requirements, commercial and industrial buildings may be required to stock onsite water supply for fire suppression sprinklers or firefighting efforts. Check with your local fire marshal for accessory preferences, fitting options, and installation requirements. Need a fire protection tank? Call 1-772-646-0597 to discuss your requirements or request a quote. *All accessory options are dependent on the tank model. If you have questions about corrugated tanks, please give us a call at 772-646-0597 or request a price quote. Fire protection tanks come many sizes. 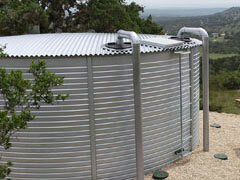 Please see our Corrugated Tank Dimensions Page for more information.